The Ta Nang-Phan Dung trekking route is tough on newcomers, but justifies all the raves it gets. To say that I was new to trekking would be the raw truth. I’d never done it, and never thought much about it till the pictures on the Ta Nang-Phan Dung trekking route posted on the internet caught my fancy. The golden rice fields, the tall pine trees, and the rugged, raw beauty of nature made me want to be there. So when a long weekend came along, I knew what I wanted to do. I signed up for a two-day one-night trek on this route that I’d seen all those beautiful pictures of. 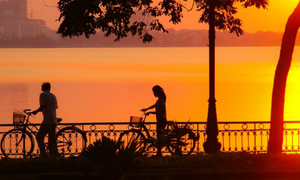 Located about 60 kilometers south of the Central Highlands' resort city Da Lat, it took about six hours to travel from Saigon to Ta Nang Commune in Lam Dong Province. There were almost 50 people who’d signed up, and I soon discovered that I was not the only one who’d never trekked. There were many of us. I was not sure whether I should be happy or worried about this. The tour leader’s opening remarks were somewhat reassuring, though. 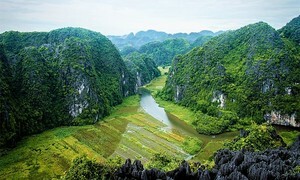 “The route stretches 55 kilometers and will pass through the three provinces of Lam Dong, Ninh Thuan and Binh Thuan. 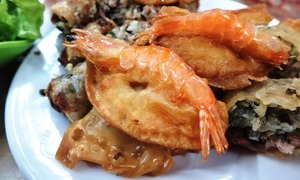 But since our tour only lasts two days, we will take a shorter route of 30 kilometers,” Hien Pham informed us. I noticed that five ethnic minority people were part of our group. One walked ahead to guide us, while the other four drove motorbikes behind us, carrying food and other items to the campsite. They were slender bodied and had darker skin, probably from the long hours they spent under the sun. They spoke a different language among themselves, switching to Vietnamese when talking with us. We were given three water bottles, 1.5 liters of water, for the whole trip, on top of the 7-8 kilograms backpack full of essential items for the next two days. Drink carefully, we were advised, because water would be limited during the trek, and be responsible, not discarding bottles and other trash on the path. As we passed through a village to reach the outskirts of the forest, the houses of wood and dried straw were so different from the cement structures in the cities. This should not have been a surprise, but seeing it up close really drove the difference home, for me. And as people stared with frank curiosity at us, I felt suddenly like an animal in a zoo. But such thoughts soon disappeared as we got deeper into the forest. 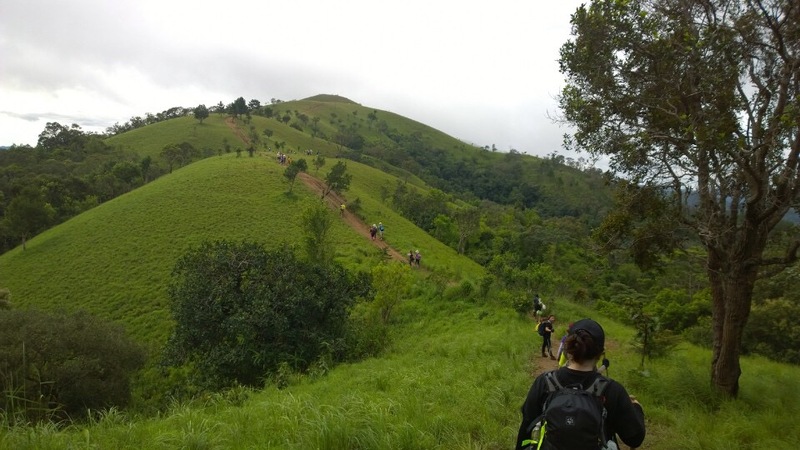 We had barely started, but my legs were tired and drops of sweat were beading my face as we went up and down slopes covered with red mud rendered slippery by heavy rain. Some may argue that it is not ideal to trek on this route during the rainy season. No sight of the sun bathing the hills of grass and trees with its golden light, for sure, but nature compensates, always. The foliage was greener and fresher, and just as beautiful. The rainy season also opened my eyes to the talent of local residents in driving across that terrain on their motorbikes. I could imagine it becoming an extreme sport, one of these days. Gia Phong, one of the ethnic minority people in our group, told us that locals put hooks on the wheels so the vehicles won’t slip. Necessity is the mother of innovation. That was good to hear, and good to see. Phong and the other locals never seemed to get tired, having done the trek many times, but they were patient, stopping and assisting first time trekkers every now and then. 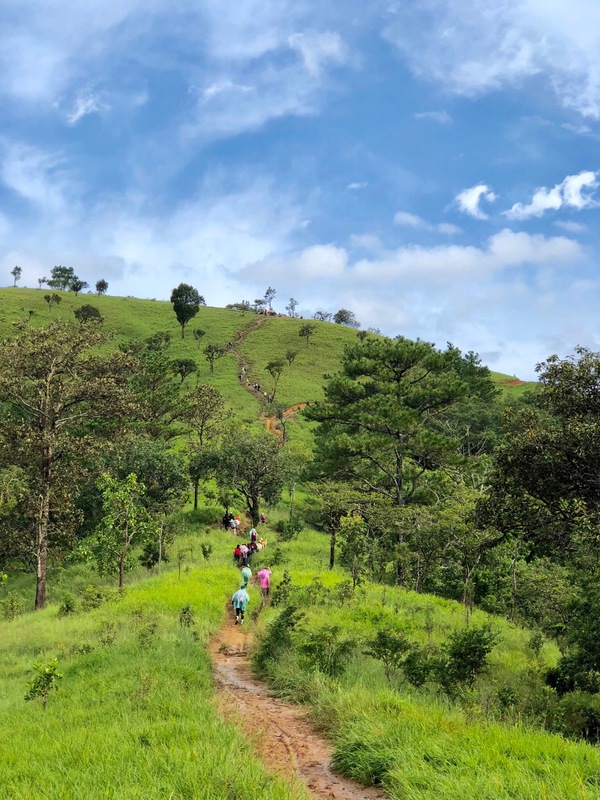 After walking for hours on what seemed an endless trail that trekkers have compared to a “dinosaur’s spine,” it is impossible not to feel tired. Then the magic happens. Everything is forgotten as one perceives and experiences nature’s splendor on show. 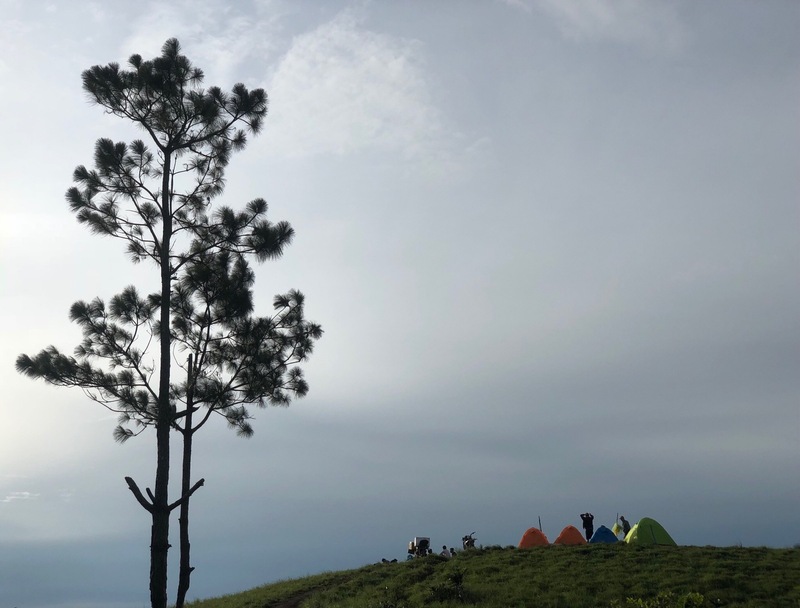 For me, it was a progression - the lush green meadows, the enchanting feel of pine forests, inhaling the clear, cold breeze and reaching the peak to become one with nature – it was fantastic. I could even feel the moisture in the air as I basked in the moment. The sight of the fog hugging the hilltops will be etched forever in my memory. It was sublime work of art that we were part of, I felt. My legs were sore and I even lost my voice for a couple of days, but the overriding feeling was that this trek was not enough to really enjoy the breathtaking beauty of the place. 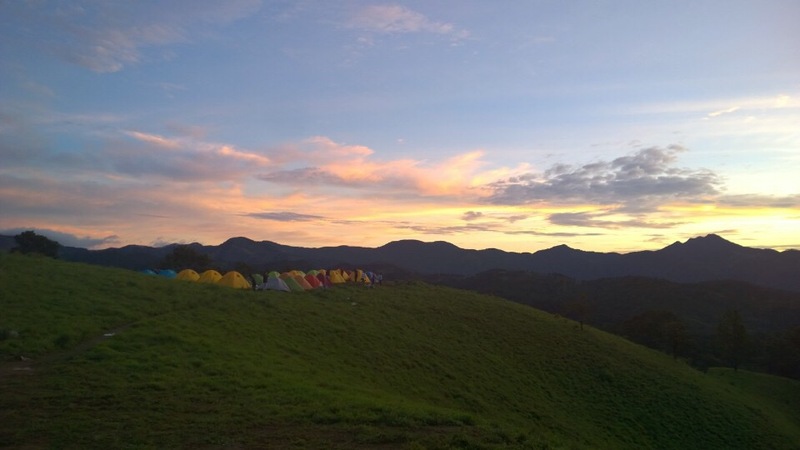 And, even though we’d camped overnight, I was not able to see the stars in the night sky, because it was cloudy. 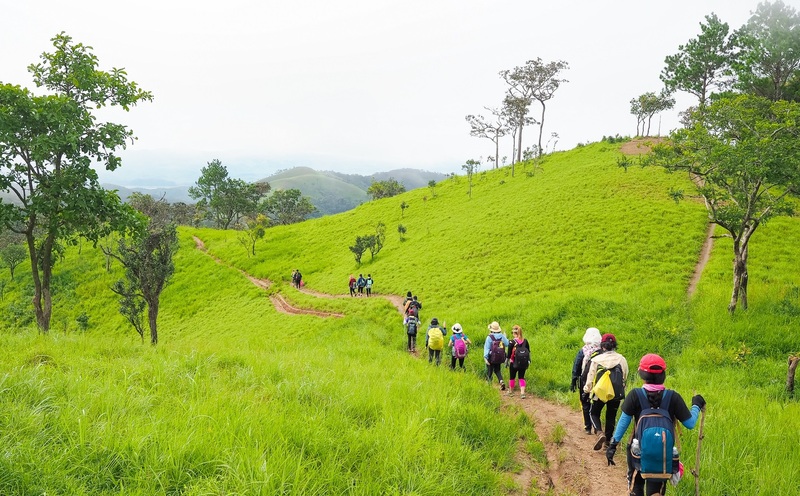 There are drawbacks and even dangers to trekking during the rainy season, and I checked and found that Phong was not exaggerating when he said people have died on this route. But, based on this “partial” tour, I only have one piece of advice for those living here, and those considering a visit to Vietnam. Put this trek on your itinerary, and... just do it.